SAN BERNARDINO, Calif. (AP) -- California's newest huge wildfire advanced on thousands of homes Wednesday, feeding on drought-stricken vegetation and destroying an untold number of structures as it expanded to nearly 47 square miles. Authorities could not say how many homes were destroyed in the first furious hours, but they prepared communities for bad news. "There will be a lot of families that come home to nothing," San Bernardino County Fire Chief Mark Hartwig said after a morning flight over a scene he described as "devastating." Flames continued to climb the flanks of the San Gabriel Mountains toward the town of Wrightwood, where authorities said that only half of the community's 4,500 residents had complied with evacuation orders. The fire erupted late Tuesday morning in Cajon Pass, a critical highway and rail corridor through mountain ranges that separate Southern California's major population centers from the Mojave Desert to the north. Hundreds of cars packed with belongings and animals left the town. The air for miles around the blaze was filled with smoke. The sound of explosions - possibly from ammunition stored in homes - could be heard in the distance. Shannon Anderson of Blue Mountain Farms horse ranch in Phelan had to evacuate 40 horses as the fire approached. "It's raining ash," Anderson said, breathing hard. 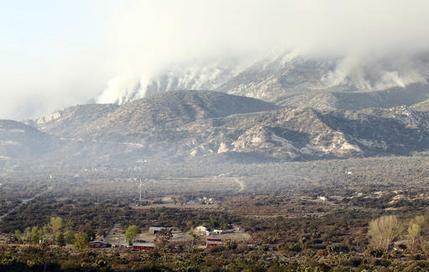 The fire erupted in a landscape ready to burn after years of drought. The weather at the time was hot, dry and windy - conditions not expected to begin easing until late Thursday or Friday. "I'm looking up here and I'm seeing buses. I'm seeing outbuildings. I'm seeing houses," he said. "What I'd do to him, you don't want to know," said Butch Cancilla, who saw his neighbor's home catch fire as he fled on Sunday. Cancilla still does not know the fate of his own home. Associated Press writers John Antczak, Robert Jablon and Andrew Dalton in Los Angeles, Sudhin Thanawala in Lakeport, Christine Armario in Wrightwood, Kristin J. Bender in San Francisco and Don Thompson in Sacramento contributed to this report. 0 Response to "US News: NEWEST WILDFIRE ADVANCES ON THOUSANDS OF CALIFORNIA HOMES"